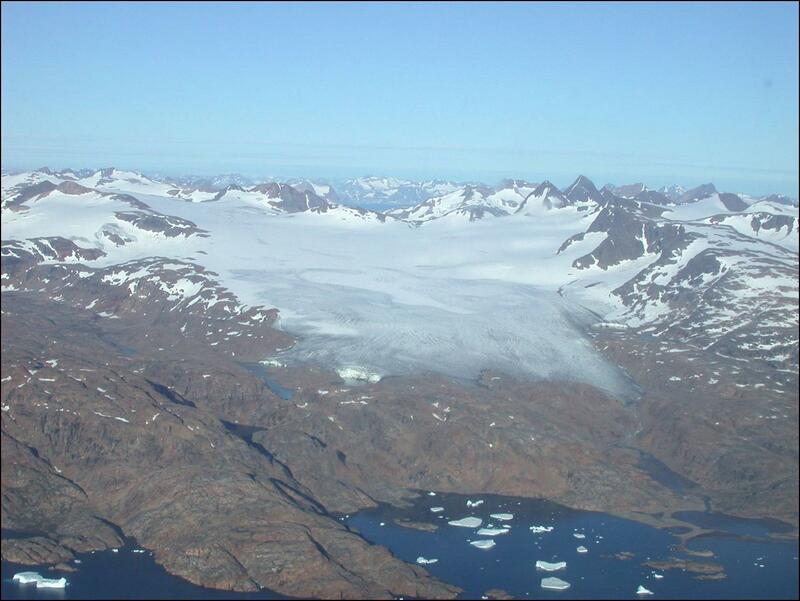 A paper by Mernild and others (2011) focusses on the Mittivakkat Glacier on the east coast of Greenland. 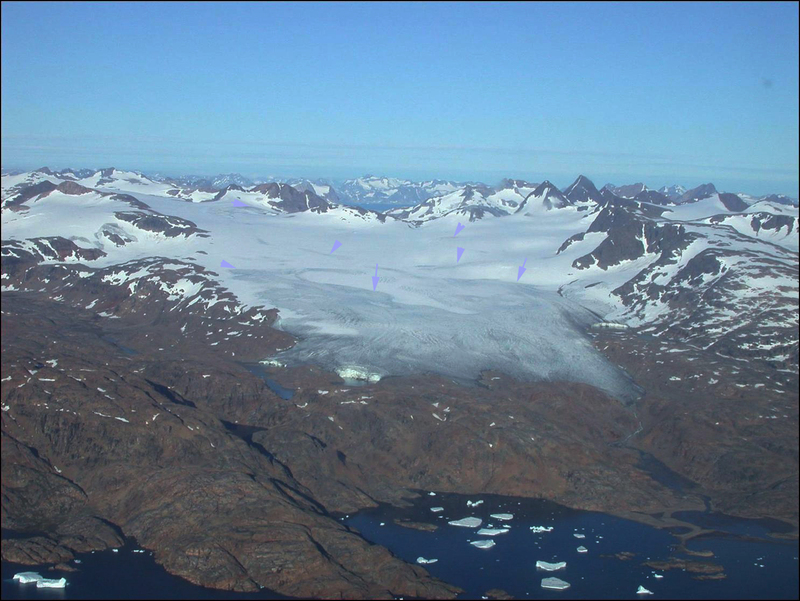 The glacier is separate from the Greenland Ice Sheet and its climate response as a result more rapid and more similar to other alpine glaciers. Mernild and others (2011) observe that the glacier has retreated 1300 meters since 1931 and that it has had a considerable negative mass balance since 1995. Sebastian Mernild at the Climate, Ocean, and Sea Ice Modeling Group, Computational Physics and Methods, Los Alamos National Laboratory, Los Alamos, New Mexico has provided the pictures that document the terminus change. The field observations is completed in conjunction with Aarhus University and University of Copenhagen, both in Denmark. 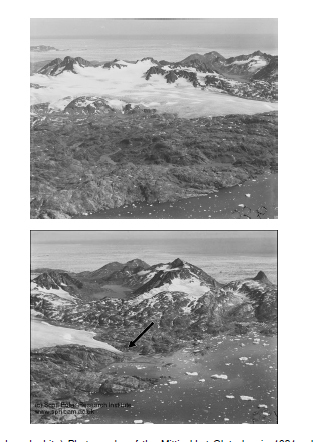 Notice the glacier ends just short of the coastline in 1931, but in 2006 is 1500 meters from the coastline. Mittivakkat Glacier has a mass balance record since 1995, that is reported to the World Glacier Monitoring Service. During the 1995-2010 period the glacier’s average balance has been -0.87 meters/year. The cumulative loss is -13 m, with the highest loss being in 2010 at -2.16 m. The 13 m loss in water equivalent snow-ice is equivalent to more than 14 m of ice thickness and 15% of the glaciers entire volume. The problem for the glacier is the loss of essentially all of its snow cover in four of the last ten years, this is not a recipe for long term glacier survival (Pelto, 2010). 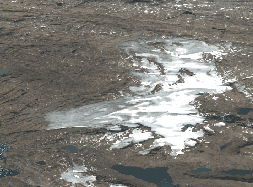 The image immediately below is a Digital Globe image from July 2005 indicating the snow covered area with six weeks left in the melt season is already limited, the glacier is in the center of the image and is the largest ice mass by far. The middle image from 2006 has areas of firn exposed indicated with blue arrows, this is not the end of the melt season yet. The lower image is from August 26 2010 and is a MODIS image catalogued by the Danish Meteorological Institute.The arrow indicates the glacier which has only 10% snow covered area, with a couple of weeks of melting left in the season. 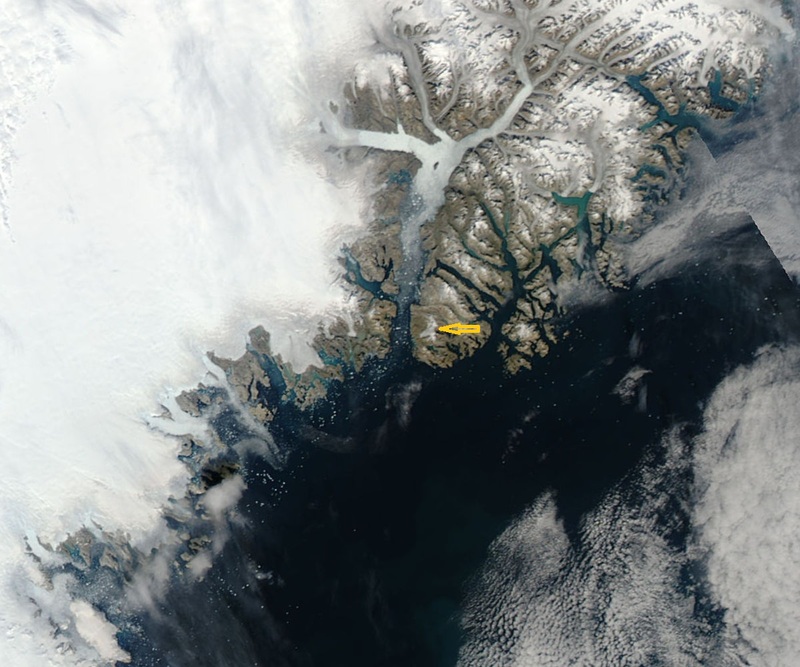 In 2010 air temperatures at Tasiilaq a few kilometers from the glacier were in the range of 1.5 C above average leading to twice the normal melt rate at the terminus, which will generate an even more rapid retreat for 2010 and 2011. The high temperatures in 2010 were not limited to this location as noted by Jason Box of Ohio State. The high melt rates were as a result not limited to the Mittivakkat Glacier as observed by the record melting reported in the Arctic Report Card. The recent large negative balances will generate ongoing retreat. Mernild observes that in 2011 the mass balance was even larger than -2.45 m An image provided by Sebastian Mernild indicates a whole in the glacier near the terminus, indicating rapid retreat in the near future.